ECHOage: The Parties of the Future! Awhile back, I started hearing about ECHOage – a new way to do parties. As my daughter is an only child, and was the only grandchild on both sides for several years, she is rather spoiled. And birthdays are a time that she gets REALLY spoiled. It started getting to the point that we were leaving lots of the toys she was getting at the grandparents house because we literally had no space for them. As a mom who is trying to be greener and less materialistic – this has been difficult! So then I looked more into the ECHOage concept. I was impressed! ECHOage allows you to send an online birthday invitation, and guests can RSVP and make contributions on the spot. 50% of their contribution goes to a charity of your child’s choice, and 50% goes towards a gift of their choice. I think it’s really cool because your child can still get a birthday gift, but also gets to choose to help a cause that they care about. A wonderful way to start instilling a sense of global citizenship in our children! My daughter was super excited to choose the World Wildlife Fund Canada as her charity of choice, because she loves animals (and especially pandas). 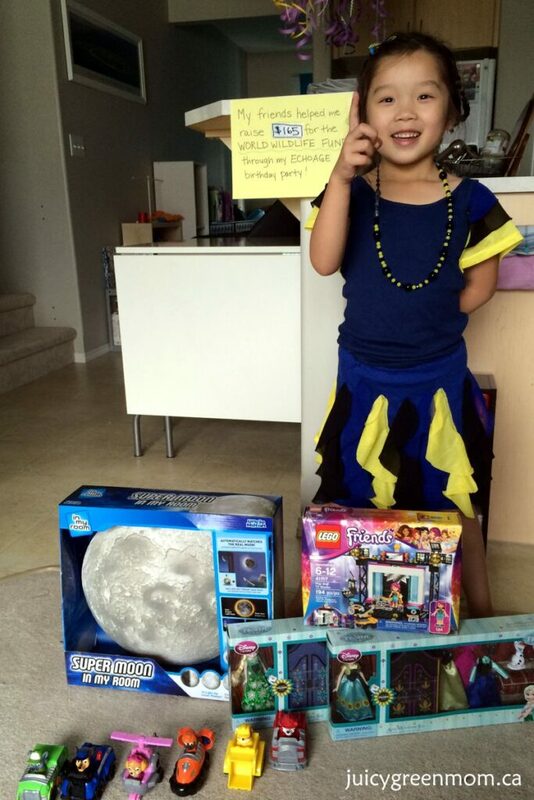 The 50% of funds for her went towards a surprise gift, which included a few things I knew she would love – the Super Moon in my Room (she’s very much into the solar system and LOVES the moon), a set of Paw Patrol figurines, a LEGO friends pop star TV studio set, and Frozen Fever dress up Anna & Elsa sets. I had the chance to ask ECHOage’s co-founder, Debbie Zinman, some questions. 1. What made you decide to create ECHOage? ECHOage was born out of our decision to “stop the madness” – we simply knew there had to be a better way to celebrate a child’s birthday! Kids are capable of so much more than adults think. We wanted to tap into a child’s natural concern for others, and make it possible for them to feel proud of their ability to give. We thought that if we built a simple online solution that made it convenient for parents, and meaningful for kids, we’d have a winning solution. It turns out that parent and kids were ready for change. Nobody needs 10-20 wrapped and packaged gifts for their birthday. Everyone wants a bigger better gift that can be remembered and put to good use. Everyone wants to help others, especially if they can so easily, and what better time than your birthday to do so. 2. How do you decide what charities to work with? In the beginning we approached charities that improve the lives of children directly. The charities we selected had to be ones that children could relate to, i.e. : understand their mission. Now we’ve grown significantly and have an all-events site for adult parties too. Over the years we have remained consistent with our screening criteria: our partner charities improve the lives of children or families directly. 3. How many ECHOage parties have there been since you started? Do you see a growing trend? We are approaching over 10,000 parties just this year. We’ve had 25,000 parties since inception! Yes, the trend is exciting to see – families are ready for a streamlined, easy solution for birthdays and events. People want something that brings more meaning to their lives. We have both. 4. How do you find people respond to ECHOage parties? For example, there were family and friends in our case that really wanted to just buy presents instead of participate in the ECHOage party. It’s interesting. Once you try ECHOage, it’s hard to be happy with the old way of doing things. ECHOage brings so much convenience and meaning to busy parents they often find it irresistible once they’ve used it. The fact that you can RSVP and give a fabulous gift to a child in under 2 minutes — without having to drive to the toy store — and thus put time back into your busy schedule is pure gold. 5. Where do you see ECHOage going in the next few years? We are North American wide at this point but we’ll be International in a few years and constantly reaching new audiences, helping new charities, and building new features to improve our service. 6. Is ECHOage a for-profit endeavour? How do you keep it running? ECHOage is a Social Enterprise. This means that society and the planet benefit first. We have a very small admin fee to keep the service running but always work to maximize the benefit to our charity partners — that is our number one priority. 7. 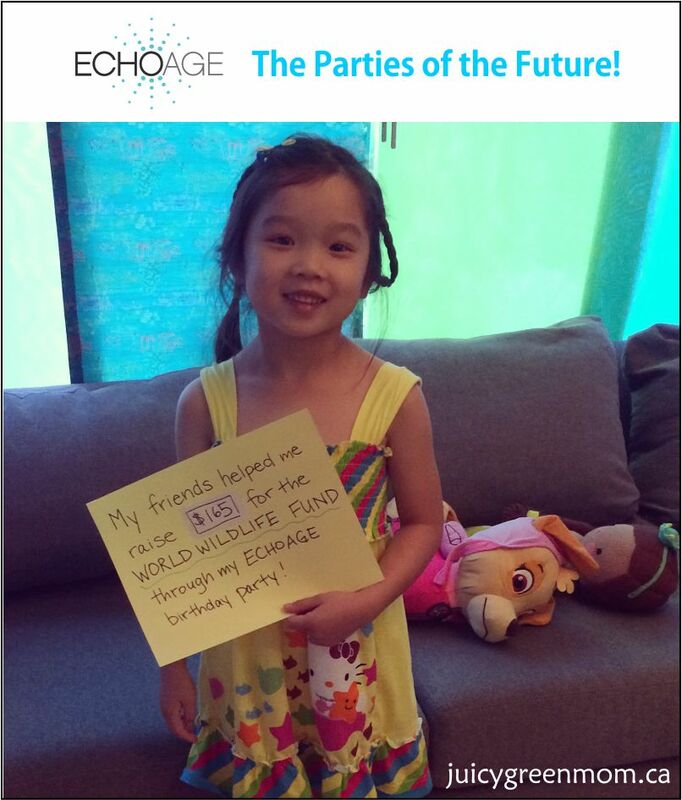 What are your best tips for parents who want to do an ECHOage party but are concerned about how others will respond? Be bold. Be proud of your child for being a leader. Be amazed at how much your little child can do to help others at such a young age. Smile at the knowledge that others will follow in your footsteps! It’s exciting to see that ECHOage is going to be expanding and that you can really ECHOage any party, not just your kid’s birthday party! We will definitely be doing it again! Will you ECHOage your next party?